Every season, I like to treat myself with (at least) one beautiful new standout item of clothing that encapsulates that particular time of the year. A piece that feels fresh and of the moment, that makes a bold sartorial statement. In fall, it was a polished gray checked blazer. In winter, it was a pair of luxe suede boots. And now that spring has finally rolled around, I’ll be getting my hands on a charming pastel dress. My sights are well and truly set on this one because nothing says spring quite like a pastel hue, and the saccharine shade is one of the biggest fashion trends of the season. Plus, there are so many incredibly chic (and affordable) candy-colored offerings on the market right now it’s too hard to resist. Pretty shades of pinks, soft lilacs, baby blues, pale yellow, and spearmint green were seen all over the spring 2018 runways in the form of knits, suiting, and whimsical dresses. So what are you waiting for? Say spring has sprung in style with one of these ultra-chic pastel dresses. 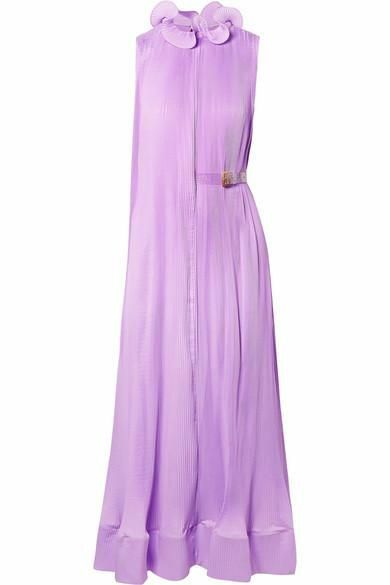 Make a statement in this season's must-have lilac hue. Layered sweet pastels for the spring win. From bridal showers to brunches. Just add a basket bag for a charming laid-back look. Upgrade your maxi dress to an alluring pale blue hue. Nothing says spring quite like a gingham print. How adorable are the tie details? Date night never looked so good. We love the ruffle sleeves and beautiful eyelet design. For all your spring and summer soirées. Keep the vintage design modern and wear with a pair of white sneakers. Up next, the under-$100 must-haves to take you into spring.